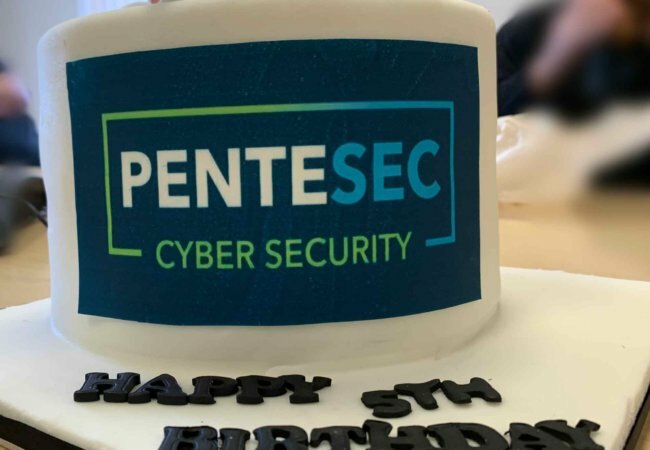 This week we’ve been celebrating Pentesec’s 5th Birthday, a huge milestone for any business in the UK and one that seems to have arrived in the blink of an eye. Looking back, it’s hard to believe that in 2014 Pentesec were just barely registered as a new Security Reseller. We were a 2 Star Check Point partner with 5 Directors and no staff, or customers on board. Six months on, we invested in a small office shared with another company and by the end of our first year we were moving forward, with 5 staff on board and a growing list of customers. By our first birthday in 2015 we had become the fastest Check Point partner to reach 3 Star status, doing so in less than 12 months. We had forged new relationships with various vendors, distributors and new partners adding several emerging security technologies to our portfolio. Our message to the channel was clear, we were there to compete on knowledge and ability and we could deliver against the best of them. Customers responded well to our message. We quickly outgrew the ground floor office and moved down the road to a much bigger space, one we hoped to see us through the next five years of growth. We continued our investment in the infrastructure, tools and training to give Pentesec a solid technical foundation, our managed and hosted services were taking shape and again we grew our team of engineers and account managers to help facilitate more growth. By our second birthday in 2016, Pentesec had become the fastest growing partner to reach 4-star status with Check Point. Our peers were beginning to take notice, as our engineers underwent more extensive training to make Pentesec the most accredited Partner worldwide. Just before our third birthday, in February 2017 Pentesec were invited to join the exclusive ‘Elite’ partner club by Check Point, making us of just 16 partners worldwide to hold this coveted accreditation and status. We had spent year three releasing our new services, onboarding new clients and growing our team and with this newest accolade we could really focus on continuing to promote what it means to be an Elite Cyber Security Partner to our customers. Towards the end of the year, Pentesec added a full training facility to it’s service portfolio, delivering all of the certified Check Point training courses from our training suite in Peterborough. In February 2018 we were shocked to receive the European Partner of the Year award, recognising our growth and expertise as unparalleled across Europe, this award was the first time we’d received public recognition of our capabilities as a company. Rising to a challenge is in Pentesec’s DNA, our technical teams routinely take on the challenges that other partners cannot, so when we heard that no-one had ever won the Partner of the Year award from Check Point twice, a new challenge was accepted. Following our fourth birthday in March, 2018 turned into a year of recognition as we went on to win the CRN Rising Star award; a commendation from the IT Channel as a whole for our contribution towards changing the perception of Value-Added Resellers and our extraordinary growth within the security industry. We also completed our ISO 9001 and 27001 accreditations as proof that we are a serious contender in our market space and to confirm our commitment to end-to-end cyber security excellence for ourselves and our customers. As we neared the end of our fifth year in February, the Pentesec team went out to Vienna for Check Point’s CPX360 annual partner event. On reflection of 2018 we felt we’d given our all and done the best we could, like we always do in all that we undertake. We awaited the partner of the year outcome with bated breath and were delighted to hear we’d done it again, a historic double win. This week, with champagne, cake and some well-deserved celebrations, the Pentesec team have been looking back at our incredible first five years. We are proud of our achievements and that we can truly stand shoulder-to-shoulder with our older peers and competitors. We know that our customers need our dynamic approach to Cyber Security more than ever and we are not resting on our laurels. Our technical team are continuing to take leading edge products and services to existing and new customers with the same levels of commitment and attention to detail that has driven our success from the beginning. We are looking forward to the next five years and all the new challenges it will undoubtedly bring. © Copyright 2019 Pentesec. All Rights Reserved.